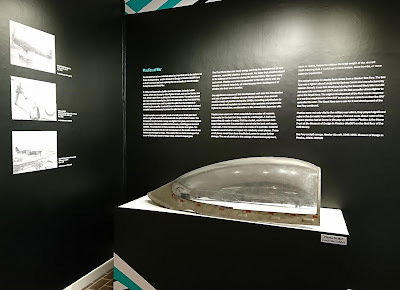 MoDiP’s latest exhibition Plastics & the home front accompanies Dazzle & The Art of Defence currently on display in TheGallery until 25th April 2019. With the main exhibition concentrating on the military aspect of defence, MoDiP wanted to explore the museum’s plastics collections from the perspective of life at home. Our pop-up exhibition features three themes: Keep calm and carry on looks at the in-it-together spirit celebrated within the civilian population, Make do and mend examines objects related to extending the life of clothing and Beauty as duty considers the popular wisdom of the time that being well groomed was a patriotic obligation. I thought I would take this opportunity to share with you a few of my favourite objects from Plastics & the home front. 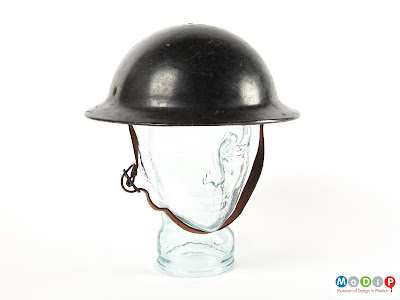 Similar in shape to the well-known MKII steel helmet used extensively by the British military throughout the Second World War, this hard plastic substitute was commercially produced for the civilian market. 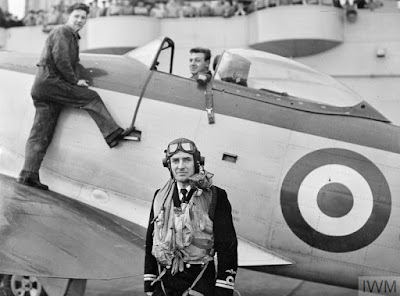 Although steel helmets were initially sold for use in air raids, after Dunkirk all steel was diverted for military use. Enterprising manufacturers came up with various alternatives such as this compression moulded, phenol formaldehyde example. Anecdotal evidence suggests they were quite robust: one report describes a building contractor purchasing several for his men after witnessing the Plasfort ably surviving a blow from the foreman’s sledgehammer! Rubber chin-strap versions were sold for use in munitions factories. The repair of clothing has been an important skill throughout history and aids such as darning eggs or mushrooms made a neat repair easier by keeping the material stretched and taught. Throughout the Second World War darning thread was unrationed and readily available and this Darn-a-lite, dated to the same period, contains a small bulb and reflector within the green, urea formaldehyde top. Illuminating the fabric repair would have been particularly useful during the blackout or in an air raid shelter but unfortunately the batteries required for the power were in short supply for most of the war. When I was a child I recall that my grandmother had one of these which I was allowed to play with and MoDiP has both the yellow and green versions in the collection. Housewife magazine reported that ‘looking better on less is going to be our duty in 1942’ and a wartime memo from the Ministry of Supply stated that make-up was as important to women as tobacco was to men! Wearing make-up was seen as a patriotic duty, adding a much-needed dash of glamour and as increasing numbers of women were required to wear their hair tied back under caps or helmets at work, hairstyles also became an important way to express individuality. As clothing became more plain and serviceable, accessories were commonly used to change an outfit from day to day. 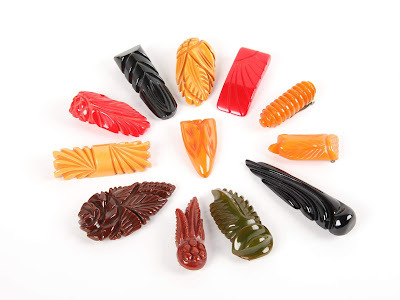 Jewellery, such as these phenolic, clip-on brooches, provided an accent of rich, glossy colour. They have a dress clip fastening at the back with small prongs to attach to the clothing as opposed to a pin stem. To see these objects and other home front plastics such as the British Restaurant tokens, visit the pop-up exhibition at the Museum of Design in Plastics (MoDiP) on the first floor of the AUB library, running until 25th April 2019. MoDiP is proud to be able to contribute to TheGallery, AUB, exhibition Dazzle & The Art of Defence. Following AUB’s collaborative contribution to Dazzle: Disguise and Disruption in War and Art, curated by James Taylor and held at the St Barbe Museum and Art Gallery in Lymington, this major new exhibition contextualises the artist Norman Wilkinson’s First World War ‘Dazzle’ schemes of disruptive camouflage against the wider contribution of the arts and creative industries to the defence of Britain in wartime. Reflecting on the roles of photographers, artists, graphic designers, acknowledgement, and fashion designers during both World Wars, the exhibition includes paintings by the Dazzle artists Norman Wilkinson, Cecil King and Leonard Campbell Taylor, as well as scenes of Dazzled boats captured by John Everett and Geoffrey Allfree; wartime information posters by Abram Games and Eileen Evans, uniform fashion photography by Cecil Beaton; and models, photographs and costumes made by the staff and students from BA (Hons) Modelmaking, BA (Hons) Fashion, BA (Hons) Costume and Performance Design and MoDiP. MoDiP recently acquired the cockpit canopy from a Hawker Sea Fury. The canopy is thermoformed from a single piece of polymethyl methacrylate, also known as acrylic and we think it looks very handsome on display. In 1936, the Supermarine Spitfire took its first flight. 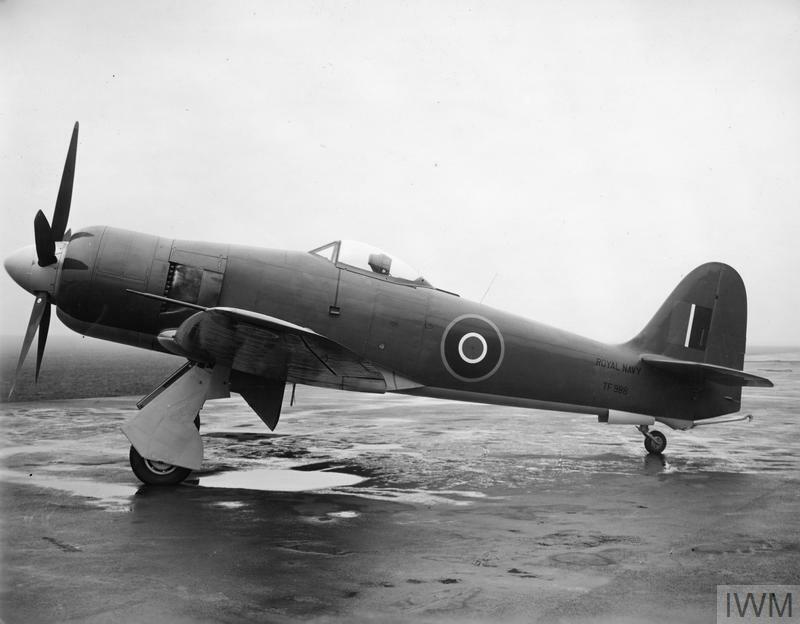 Its iconic bubble canopy, which led the way for other fighter planes, such as the Hawker Sea Fury, stood it apart from anything that had been before. The earliest planes had open cockpits exposing the pilot to the elements. 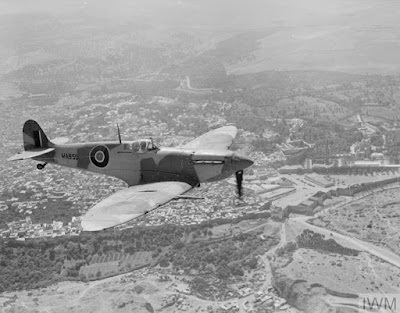 In the First World War, glass windscreens were used to protect the pilot from the turbulent air created by the propeller. As planes became faster and flew higher, enclosed cockpits became necessary to protect the pilot from atmospheric pressure. Cockpit canopies were originally made of small panes of flat glass held within a rigid framework that interfered with the pilot’s field of vision. The transparent acrylic bubble canopy was lighter than glass, and could support its own shape without any additional framework, providing good all-round visibility. The production of these canopies was simpler than glass. The acrylic was shipped to the plane manufacturers in flat sheets where it was heated and moulded to shape. This avoided the inevitable breakages that occurred during the transit of large, heavy, awkward shaped glass. The First World War saw much energy put into the development of new materials, especially plastics, and as such, the roles that plastics played in the defence of the country during the Second World War were many and varied. Plastics were seen as essential to the war effort; with the scarcity of natural materials, all sides focused their development of plastics into their use in conflict. One significant outcome of this development work was the introduction and use of plastics in military aircraft. 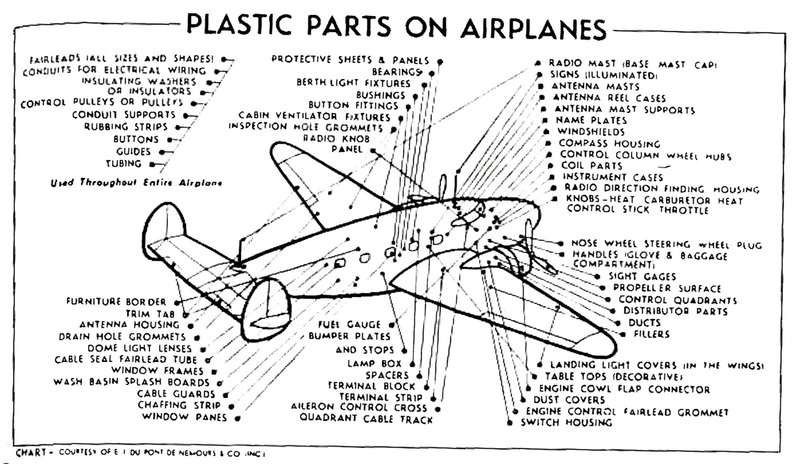 The diagram below depicts just a few of the sections of a plane that could be made of plastics during the 1940s. Other uses included polyethylene to provide electrical insulation for airborne radar systems and polyamide (nylon) for parachutes, an alternative to the unavailable Japanese silk. 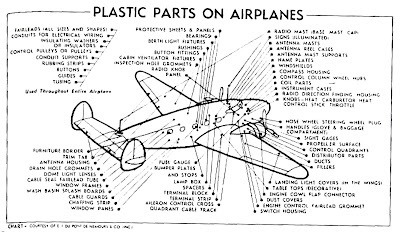 Plastics parts on airplanes from Plastics in American Aircraft, British Plastics and Moulded Products Trader, February 1942. Plastics were used over other materials for a number of reasons, but most significantly for the fact that they could do a better job. A fuel tank supporting rib made of metal, if hit by a bullet, would be torn into large fragments with the potential to penetrate the tank and cause a fuel leak. If the framework was to be made of a synthetic material instead it would shatter on impact into relatively small pieces. These small pieces would then have insufficient power to cause further damage. The use of plastics in the casings of electrical equipment, such as radios, helped to reduce the total weight of the plane itself meaning that it could carry more troops, more bombs, or more essential equipment. Plastics were not only vital to the military war effort; they played significant roles in the domestic lives of the people. Find out more about some of the impact plastics had at home in the pop-up exhibition Plastics & the home front at the Museum of Design in Plastics (MoDiP) on the first floor of the AUB library. 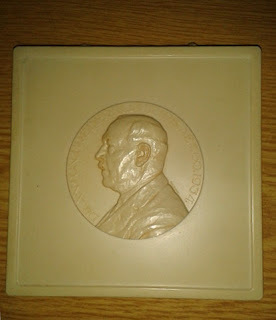 Recent acquisitions to the museum’s collections include these three commemorative plaques from the 1930s, dedicated to members of the royal family of the Netherlands and to Anton Philips, founder of Philips Electronics. 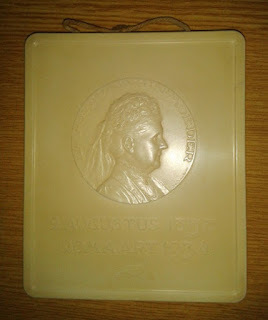 The plaques are made from Philite compression moulded urea formaldehyde and produced in the Philips’s Eindhoven factory. Both phenol and urea formaldehyde, was produced and used extensively by Philips Electronics as the casings of speakers and radios, razors, bowls and trays, door handles, light fittings, and switches etc. 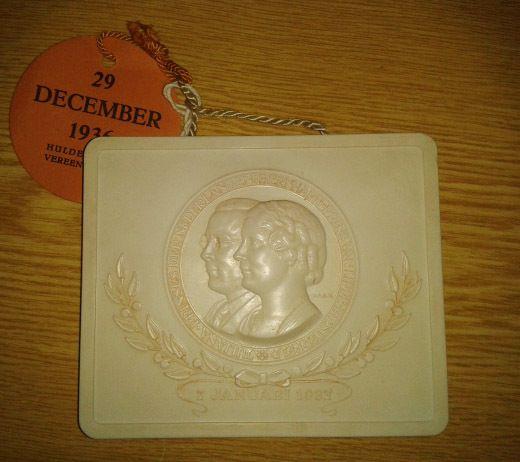 and of course commemorative plaques. They are highly stable materials with high wear resistance, high thermal and electrical insulation value, are resistant to very high temperatures, and are virtually non-flammable. Philips first began production of Philite in 1923. 1. 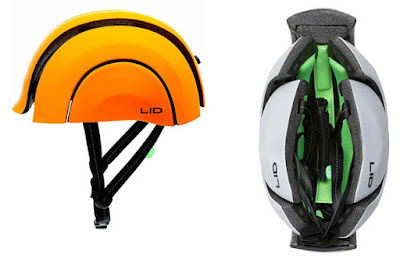 British startup LID Helmets launched their first design, a foldable bike helmet called The Plico, in 2017. It reduces in size by a third to enable easier storage when not in use, automatically adjusts to the size of your head ensuring a correct fit each and every time and is sold with a rear clip-on light pre-attached. 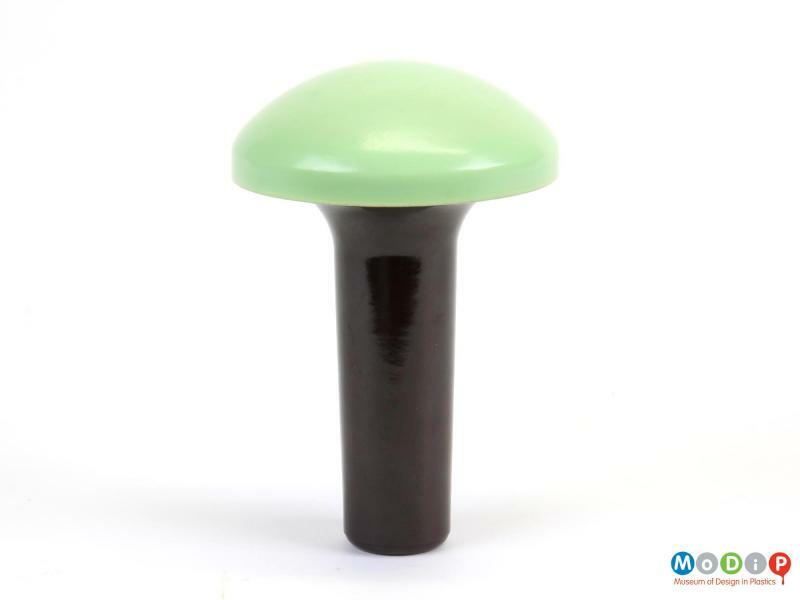 Made from a polycarbonate outer shell with an expandedpolystyrene inner core, the foam liner is recycled from the car manufacturing industry. The Plico in both extended and folded position. 2. 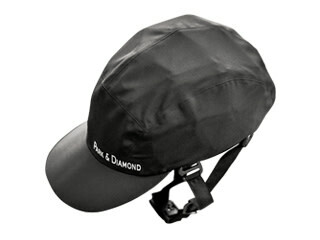 Park & Diamond have designed a collapsible bike helmet that looks like a baseball cap and folds down to the size of a water-bottle for easy storage. 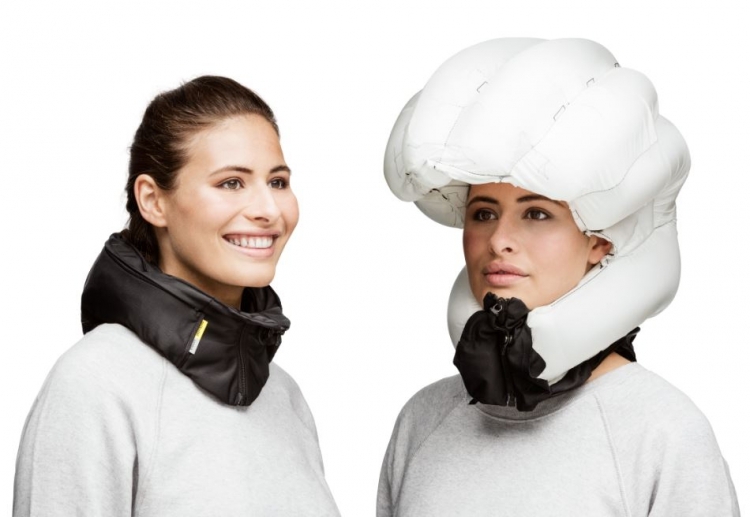 It also has a polycarbonate outer shell but an ethylene-vinyl acetate inner core, which the company claims will absorb and dissipate three times more elastic energy than a traditional bike helmet. The outer skin is interchangeable so that the colour of the helmet can be easily changed. 3. Swedish company Hövding have to date sold more than 130,000 of their revolutionary airbag helmet. Made of nylon, the helmet sits around the neck like a collar with a gas inflator stored within, powered by a battery. The collar contains sensors that are controlled by an algorithm that can distinguish between normal cycling and an accident. MoDiP has a number of bike helmets in the collection as well as a range of other sports and safety helmets that can be viewed or borrowed for inspiration.